Designed to protect the shins, insteps, feet, and toes, TurtleSkin WaterArmor Gaiters are constructed of hinged protective panels that flex with each step. The gaiters allow UHP water jet operators the freedom of movement to do their work and keep their lower extremities safe from dangerous waterjet blasts. TurtleSkin WaterArmor protective gaiters offer increased protection for UHP water jet operators at all pressures at specified flow rates. 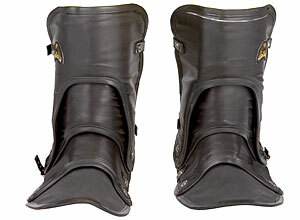 Patented TurtleSkin WaterArmor Gaiters are designed with straps for custom adjustment to fit the height of any operator. TurtleSkin WaterArmor UHP water jetting chaps, gaiters, upper torso, and arm protection are all sold separately, so you buy only what you need when you need it. This feature helps to reduce your PPE costs. WaterArmor protective gaiters are made up of components that can be replaced individually when one section is damaged or becomes worn. UHP water jetting is demanding, difficult work. The unique design of TurtleSkin WaterArmor provides extensive protection to the front of the operator where it is needed most, while the open back allows air circulation to keep the operator cool and comfortable. TurtleSkin WaterArmor's chaps have cushioned knee pads that reduce discomfort while kneeling on hard surfaces. TurtleSkin's patent for the tightest weave ever achieved in aramid fibers gives WaterArmor superior strength in a lightweight design that will not contribute to operator fatigue. WaterArmor's patented fabric system bends with the body so that each panel moves independently, allowing for greater operator flexibility. 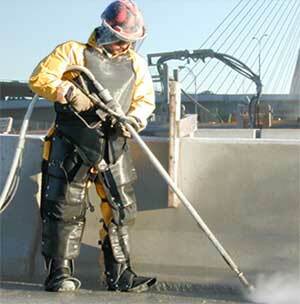 The outer layer of TurtleSkin WaterArmor equipment is both rugged and easy to clean.